Spanish support materials can improve academic achievement. While Hispanic students are learning English, it is beneficial to provide them with instructional materials that are in their home language. This allows them to apply their current knowledge to develop new skills. Do you need Spanish resources to support English Language Learners? 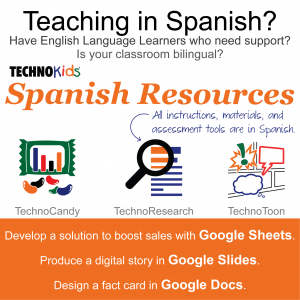 TechnoKids Inc. has a Spanish Bundle for Google Apps to support English Language Learners. The bundle is a collection of technology projects. Each project includes a teacher guide for curriculum planning, student workbook with handbooks to promote independence, and resources to reinforce learning. The teacher guide for each technology project is available in English and Spanish. This allows a teacher to organize lessons. The student workbook for each technology project is available in Spanish. The provides learners with detailed instructions they can follow. They can then complete the work in English independently because they have a firm understanding of the task. The resources such as sample files are in Spanish to provide a model of a completed project. Pride in Home Language: When teachers use instructions in the student’s first language it demonstrates that English is not a replacement of their first language. Instead, it is an addition. This allows the student to feel pride in their home language and not view it as a disadvantage. It is important for learners to recognize that knowing their first language is relevant to academic success in their new language. Increase Academic Achievement: English Language Learners are expected to meet curriculum standards. This can be difficult when they are not proficient in English. Using Spanish materials to explain the instructions allows students to understand the steps to completing a task. This increases the likelihood of academic success. Reduce Cognitive Load: Completing an assignment can be very difficult for English Language Learners. They struggle to understand the instructions, learn the content, and then apply their skills to demonstrate their knowledge in English. Using Spanish materials reduces the cognitive load. Attention switches from comprehending the task. Instead, students can focus on organizing ideas and writing in a foreign language. Boost Skills: Teaching using Spanish materials helps English Language Learners. The resources develop vocabulary and concepts in their first language. This boosts cognitive skills. Encourage Independence: English Language Learners benefit when they can take charge of their learning. Spanish resources allow them to work independently. This makes them feel confident which encourages risk taking in learning a new language. English Language Learners need to function in an information and technology based society. The Spanish Bundle for Google Apps teaches essential 21st Century skills. Activities target word processing, presentation, spreadsheet, and Internet research skills. The fun lessons integrate technology into subject areas such as language arts and mathematics. The Spanish Bundle for Google Apps includes three technology projects. These are TechnoToon, TechnoResearch, and TechnoCandy. The instructions and resources are in Spanish. This allows learners to understand how to use technology. They can then apply their skills to use English to complete the project. In TechnoToon, students learn how to tell a digital story. This is an excellent way to build writing skills. The activity uses Google Slides. In TechnoResearch, the lesson plans explain how to conduct research to learn about a topic. Students arrange the information to create a fact card. Google Docs is used to complete the task. In TechnoCandy, students follow detailed lessons to use spreadsheets. They analyze, graph, and calculate data. This helps them to develop a plan to boost candy sales. A report outlines their solution. The assignments use Google Sheets and Google Docs. The Spanish Bundle for Google Apps provides teachers of English Language Learners with helpful materials. Students have support in their home language. This gives them the skills and confidence they need to succeed. Learn more about the Spanish Bundle for Google Apps. Do you want to integrate technology into a Spanish immersion classroom? Is your instruction primarily in Spanish? TechnoKids has published the Spanish Bundle for Google Apps, a collection of three technology projects. 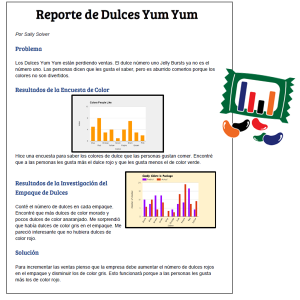 Each project includes a teacher guide, student worksheets, and resources in Spanish. The Spanish immersion instructional materials are for middle and high school language learning programs. Technology can help language learners. It can teach vocabulary through apps that use games to engage students. Recording devices allow students to practice pronunciation. As well, online sources can display in Spanish to improve reading skills. These are excellent ways to develop fluency. However, technology has a prominent role when Spanish language proficiency is the goal. A multi-dimensional approach infuses digital literacy into all subject areas. Students use computing devices to conduct research, organize information, present findings, create publications, analyze data, develop solutions, and more! Finding suitable materials for a Spanish immersion program can be a challenge. Teachers can waste time in an ongoing search for teaching resources that will engage students. Although, preparing your own materials is a solution, this too can be time consuming. Often creating the resources takes more time, than completing the activities. The Spanish Bundle for Google Apps by TechnoKids Inc. offers a solution. The interdisciplinary lessons in Spanish integrate technology into curriculum to include 21st Century skills. 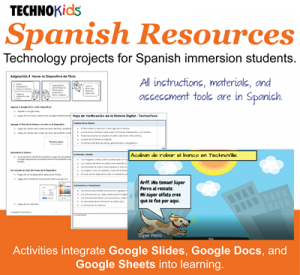 The TechnoKids’ Spanish Bundle for Google Apps uses a project based approach to learning. Each technology project actively involves students in the learning process. In TechnoToon, instructions explain how to create a digital story using Google Slides. This project develops presentation and storytelling skills. In TechnoResearch, learners publish a fact card in Google Docs. These lessons teach research and word processing skills. In TechnoCandy, students analyze data in Google Sheets. They recommend a business plan to boost candy sales. This activity fosters critical thinking and spreadsheet skills. Teacher Guide: The teacher guide is in Spanish. It contains a curriculum plan, instructional strategies, activities, and assessment procedures. Use it to organize your lessons. Student Workbook: The student workbook is in Spanish. It has step by step instructions that students follow to complete a project. Two versions of the workbook are available. The workbook is a PDF book for easy printing. In addition, the workbook is digital worksheets for paperless classrooms. Use this helpful resource to have students practice their reading comprehension and work independently. Resources: The resources are in Spanish. Resources include assessment tools, samples, and templates. Assessment tools outline learning expectations. The samples are a model of a completed project and are a source of inspiration. The templates provide a framework for learning. Being proficient in Spanish is an advantage. It is spoken by 440 million people. Spanish is the third most spoken language in the world and is the official language in 21 countries. Spanish immersion classrooms prepare students for advanced language tracks and unique careers. Integrating technology into Spanish immersion classrooms creates meaningful learning experiences. Are you teaching in Spanish? Do you have English Language Learners who need support? Is your classroom bilingual? Do you need quality instructional materials to engage students and help them succeed? Great news! 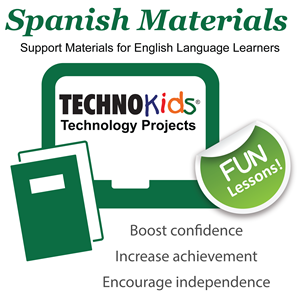 TechnoKids Inc. has released a collection of technology projects in Spanish. These Spanish resources have lessons designed for elementary, middle school, and high school students. The Spanish Bundle by TechnoKids Inc. is a collection of three of our most popular technology projects – TechnoToon, TechnoResearch, and TechnoCandy. Each technology project has a teacher guide, workbook, and resources. All instructional activities, materials, and assessment tools are in Spanish. The lessons have detailed instructions for Google Docs, Google Sheets, and Google Slides. They are ideal for a language learning program. In addition, they can be used to help students that are not yet proficient in English to succeed in a classroom setting. The lesson plans in the Spanish Bundle use a project based learning approach. Students use technology to create a digital story, design a research card, and manipulate data to develop a solution. The Spanish activities blend technology skills with language arts and mathematics. Spanish resources for teachers and students. TechnoToon: Create a digital story using Google Slides. Combine images, text, and animation to produce an animated comic strip. Have students write the story in Spanish or use the Spanish worksheets to assist English Language Learners who need support. View a digital story made using TechnoKids Spanish resources. TechnoResearch: Design a Fun Fact Card using Google Docs. Research a topic and then organize information into an informative publication. Develop essential Internet research and word processing skills. Have language learners write the fun fact card in Spanish or have Hispanic students use the materials to independently follow instructions. TechnoCandy: Boost candy sales. Analyze data using Google Sheets and then recommend a solution in a Google Docs report. Teach essential spreadsheet skills. Integrate technology into a language learning program or provide English Language Learners with Spanish resources to succeed in the classroom. View a sample spreadsheet lesson in Spanish. Computers and technology are valuable tools that can help students learn a language. Activities from the Spanish Bundle use Google Apps to provide meaningful tasks that encourage independence and make learning fun.